The entry list for the 2018-2019 FIA WEC super season and the entry list for the 2018 Le Mans 24 Hours have been revealed today. FIA and ACO announced that 36 crews will participate in the FIA World Endurance Championship which will kick-off in May at Spa-Francorchamps. It’s the biggest ever grid in world’s premier sports car competition. At Le Mans 24 Hours, the number of entries is traditionally limited to sixty. 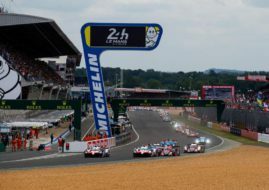 The regular FIA WEC entries will be joined by 24 crews from other competitions in June at 86th edition of 24 Hours of Le Mans. Ten LMP1 prototypes, including two Toyota TS050 Hybrids and eight non-hybrids, will participate full season in the World Endurance Championship and also at Le Mans. The LMP2 grid for FIA WEC features seven cars of three chassis manufacturers (Ligier, Oreca, Dallara) while twenty LMP2 cars will fight for Le Mans 24h trophy. The 19-car FIA WEC GT grid is divided into ten GTE Pro crews and nine GTE Am crews. At Le Mans, thirty GT cars will participate – seventeen GTE Pro and thirteen GTE Am.